The term ‘growth hacking’ probably isn’t new to anyone who’s been following the digital marketing trends over the past few years. The idea is to use innovative marketing strategies to build up a user base and increase business growth, at an exponential rate. While this may sound like a little more than savvy marketing to some people, there is one fundamental difference between growth hacking and most other marketing efforts – Growth Hacking’s relentless focus on user growth above everything else. In the growth hacking world the number of active users is the main metric of success, and the entire strategy is constructed around continuously scaling up. 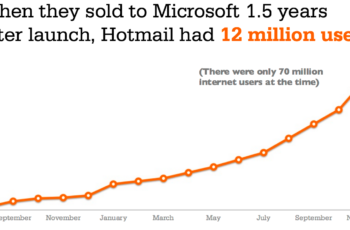 Usually a growth hacking strategy is built right into the product itself (e.g. a referral scheme). By leveraging existing users to bring in new ones it is possible to create a system that scales almost infinitely, virtually on autopilot. It doesn’t have to be users on your own website either; some highly successful online businesses grew initially piggybacking and leveraging the users/traffic on another website (such as the Airbnb example later in this article). Growth hacking techniques are usually also a lot cheaper than traditional advertising, which is one of the reasons why it’s held in such high regard by tech startups who often have limited budgets and rely on scaling to become profitable. When growth hacking systems are perfectly implemented they can literally transform an unknown startup into undisputed market leader in a very short time, and this is exactly what happened with Dropbox. There was no clear market leader in the cloud storage industry when Dropbox started – most people didn’t even know they needed cloud storage in the first place! However, that soon changed when Dropbox came along and implemented a clever referral scheme that rewarded users for inviting their friends to try the service at no cost. They even took it one step beyond a traditional referral scheme and rewarded both the user and the invitee with additional storage space for free. 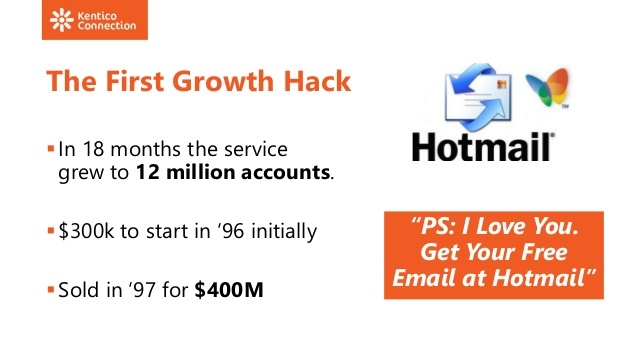 Just as with Hotmail, and countless other growth hacking examples, once a system like this reaches critical mass there is almost no stopping it. The Dropbox Space Race was an example of a very successful growth marketing strategy. In a nutshell, Dropbox created a competition for Universities around the world. 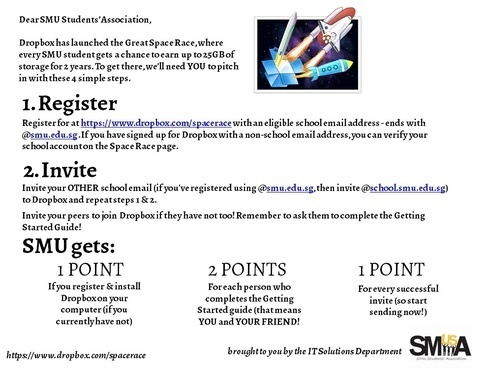 Every student who signs up (for a free account) gets an extra 3GB of space, in addition of the original 2GB. That’s 5GB in total. And up to 25GB of space if your school wins. Imagine tech savvy undergrads who are on a budget. Then imagine the number of things they can do with the amount of cloud storage – from sync-ing up their homework / lecture notes, to sharing of video and other media files with their friends. 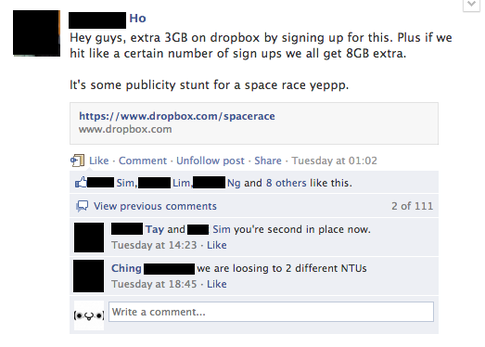 In fact Singaporean students were so competitive that someone even created a Facebook Ad to promote their link. Some even sent out mass emails to the entire university. Let’s step away from referral schemes for a moment to check out a completely different style of growth hacking; leveraging the users and traffic on another website. One of the key reason to Airbnb’s growth was the fact that they integrated their website with Craigslist early on. Whenever someone posted a listing on Airbnb they were offered to also post it on Craigslist automatically for more exposure at no extra cost. Of course Craigslist is a classified website with millions of users, and by siphoning some of them off to Airbnb they were able to reach critical mass and grow quickly with no upfront investment. And, of course, the more people that posted listings, the more well known the site became, until eventually it was the leading website in its niche.